From Journalist Robert Parry: You can get one of my earlier books, either Secrecy & Privilege or Neck Deep, for only a nickel when you buy my new book, America’s Stolen Narrative, through the Consortiumnews.com Web site. And shipping is free. 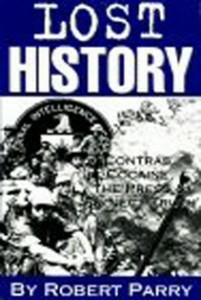 America’s Stolen Narrative is subtitled “From Washington and Madison to Nixon, Reagan and the Bushes to Obama.” The book’s opening chapter challenges the Tea Party’s misinformation about what the Framers were doing when they scrapped the states’-rights-oriented Articles of Confederation in favor of the Constitution. The two companion books, Secrecy & Privilege and Neck Deep, track the rise of the Bush family dynasty from the emergence of George H.W. 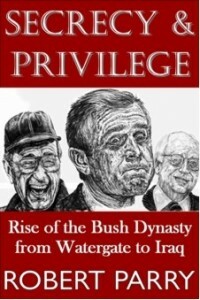 Bush as a shrewd political operative to the disastrous presidency of his son, George W. Bush. You also can buy America’s Stolen Narrative as an e-book from Amazon.com or barnesandnoble.com. Amazon also carries it as a regular book. If you buy the book through the Consortiumnews.com Web site, a portion of each sale will go to support our investigative journalism.